The MCB rolling machine line is the ideal apparatus to bend plate from 10 mm to 200 mm thicknesses with widths varying from two to up to six metres. It is accurate, user friendly and fast (plate advancement speed of six mt/min) and represents the best available on the market today. The MCB also represents advantages not available on other models. It can automatically pre-bend the leading edge leaving the shortest possible flat end. The MCB can roll the plate without removing, turning or reintroducing the plate as required by a single leading pre-bending machine used for this range of plate thicknesses. Unlike three roll models that require pre-bending on both ends, the MCB only requires that leading edge is pre-bent. Another important advantage is the possibility to make a shell in a single pass. 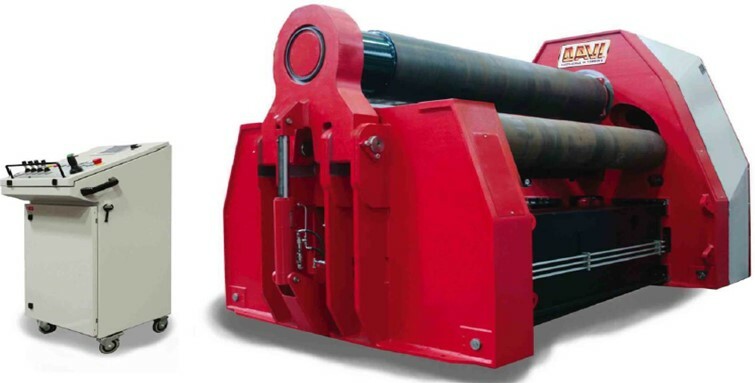 The operator needs to identify only the lateral rolls position whereas on the three roll machine it is necessary to identify the six or nine positions to bend successfully a single shell. - Best pre-bending (shortest flat end), The DAVI planetary swing guide technology allows the operator to obtain absolutely the best results in pre-bending. - Greater Power is available (bending capacity), Bending power increase is distriduted homogeneously irrespective of shell diameters, even during pre-bending. 777 Mahachai Road, Wangburapaphirom, Pranakorn, Bangkok, 10200, Thailand. Machine Tools. We serving a quality service with ISO 9001 Standard.